A good friend recently mentioned to me that one day he would like to start his own business…to be his own boss and do his own thing. Having been in the business start-up/growth phase for some time now I offered him some advice on the subject. I told him that in my opinion, the hardest part of growing a business from scratch was learning to operate without a road map. Learning how to make your own decisions about what to do and how to best use your time. After thinking about this for a few days, I’d like to amend my statement. The hardest part about building a business is not learning how to work without a road map, it’s defining and maintaining your vision. Last summer the family and I vacationed in Colorado. The last part of the trip entailed visiting some family living in Durango. On a stretch of east/west highway between Pagosa Springs and Durango you’ll drive through the Southern Ute Indian Reservation. Driving either direction you can’t help but notice a huge rocky land formation to the south of the highway. You can see it for miles. It’s the most significant landscape in an environment full of significant landscapes. This rocky outcrop I learned, is called Chimney Rock. The site was home to the ancestors of the modern Pueblo Indians 1,000 years ago and is of great spiritual significance to these and many other native tribes. Generations of native peoples visited this place from far and wide and many took up permanent residence in its shadows. 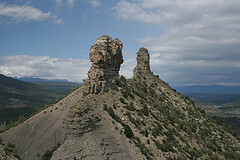 Do you think that the native people always knew about Chimney Rock? Do you think they always knew about its presence and its exact location? No. I’d guess not. The same is true in business. Once the vision or end goal is defined, the path to get there, the steps you need to take to accomplish your goal really become self-apparent. Now keep in mind that self-apparent does not necessary mean easy. But when you know where you want to go, when you have a destination in mind, the tasks necessary to get there become more clear. I ask myself this question a lot. At least once a day. Building a business is different. No one is there to tell you what to do. I think that when you’re uncertain about what to do, the underlying cause is usually a loss of vision. A temporary lapse in where you’re at with respect to the big picture.